The first noticeable thing when chatting to the Happy Little Pill singer was his trademark melodic Australian accent, it’s verging on hypnotic and for all I knew he could have been spitting Nicki Minaj lyrics because I was completely under his spell; one that millions of teens around the world have fallen under. It’s impossible to give this young star an exact title because his talents are so diverse. Troye Sivan’s career has seen him dabble in an acting, become a much loved internet-personality and, most recently, a singer-songwriter. The Aussie heartthrob released his debut EP entitled TRXYE on the 15th of August 2014, which saw him riding a wave of success as it shot to number one on the iTunes chart in fifty five countries around the world; acting as a trailblazer for all online personalities looking to pursue a dream in music. A lot of artists today in the music industry often judge their own success on the charts and performers like Katy Perry or Beyoncé and other mainstream acts strive to get as many top ten singles as possible but for someone with a cult following like Sivan, the objective is a bit different. “Chart success has never necessarily been my goal,” says the humble Sivan, who is evidentially not too anxious about replicating his previous accomplishments. He claimed that writing for the charts shouldn’t play a big part in artistry. “Chart success doesn’t define an artist’s worth, a lot of the people I listen to have never had a chart hit, so it’s not really that important. I just want people to really enjoy it”. As with his previous EP, the artwork of WILD is rather unusual. Both releases featured the chiselled face of Sivan and both had his eyes covered. 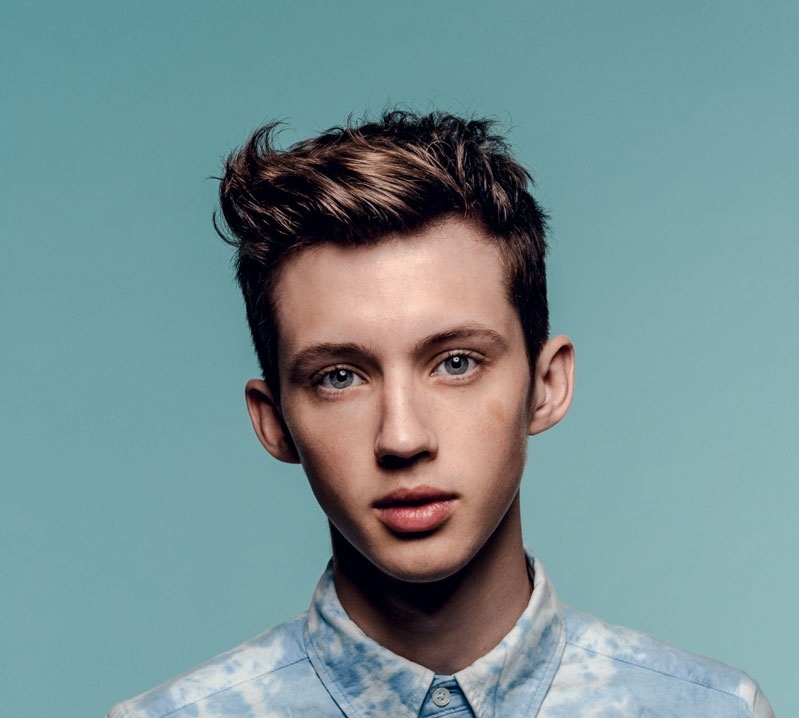 On WILD it’s yellow petals hiding the singer’s eyes and with TRXYE it’s the EP name. According to Sivan this ongoing hidden message “originally started as I was just feeling uncomfortable just whacking my face on the cover, it seemed a little cheesey to me.” Even more interesting, he also elaborated that covering his face was a way of speaking out about censorship and adds. WILD is accompanied by three music videos, which follow the story of two young boys who are childhood friends and struggle to understand the romantic feelings they have towards each other. Sivan tells a narrative through these music videos, all under the common name Blue Neighbourhood for the trilogy. The WILD (Blue Neighbourhood Part 1/3) music video debut on Youtube/VEVO on September 3rd and has raked in a massive 4.3 million views to date. On September 25th, Sivan released the second video instalment of the trilogy; an emotional video and an instant fan favourite. As mysterious as the album is, upon further inspection it becomes very clear that Sivan was heavily influenced by discoveries of his sexuality; he famously came out to his parents and fans via a YouTube video when he was only fifteen years old. The album in essence is a very personal recalling of some intimate memories and the tone of nostalgia carries throughout the record from start to finish. While the album touches on love and heartbreak, ‘Bite’ is one of the more sexual melodies and got us thinking that maybe he had someone important in mind. Sivan admitted that WILD is definitely the most pop-infused track he has ever written but stated that it wasn’t intentional or an attempt to mainstream his music. Though he’s new to the music scene, he was willing to talk about working with other people in the industry. Earlier in the year when the album was in the early processes of production Sivan tweeted his delight in recording his album in the same studio as Lana Del Rey which he admitted “was an awesome and inspiring experience.” Working nearby or collaborating with other artists isn’t anything new for Sivan who has previously worked with Zedd and band Broods on his new EP. In the future he says he’d love to work with Ollie from Years and Years. Troye also discussed Taylor Swift and her views on streaming music. That’s not a problem Sivan is going to face anytime soon though. With massive celebrity backing, not to mention the support and respect from the international LGBTQ* community, things for Troye Sivan are undoubtedly about to get WILD.